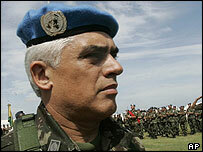 The commander of the United Nations peacekeeping force in Haiti has been found dead in a hotel room. The body of Gen Urano Teixeira Da Matta Bacellar was discovered early in the morning in the capital, Port-au-Prince, with a bullet wound to the head. UN officials said Gen Teixeira, who took over as head of the 9,000-strong peacekeeping force last September, appeared to have shot himself. He will be replaced by Chilean General Eduardo Aldunate Herman. Brazilian President Luiz Inacio Lula da Silva said Gen Teixeira had conducted a difficult task with "excellence and responsibility". "[The Brazilian government] reaffirms its determination to support the people of Haiti in the construction of peace and political stability," he said. Haiti continues to be blighted by political and criminal violence and instability, nearly two years after President Jean-Bertrand Aristide was ousted. The peacekeepers have so far had little success in improving security. The mission's mandate, which expires in mid-February, also includes supporting the political process. Correspondents say the Brazilian general's death casts further doubt over the timing of the country's election, which has already been postponed four times. The poll has faced repeated delays because of spikes in violence, delays in distributing 3.5 million voter identification cards and problems with polling stations. On Friday, the UN Security Council urged the country's interim government to hold an election by 7 February. Voting had originally been scheduled for November, then moved to December, and then delayed a third time until 8 January. But last week Haiti's provisional electoral council postponed the election again, without setting a new date.